In the Buccaneers Class, the 112ft (34m) Sparkman & Stephens sloop Kawil scored their third victory to seal the class win with a race to spare. Kawil got another cracking start, all the more impressive as helm Lars Loftus explained. “The instruments went off line, so that was old school style.” In Race 3 John McMonigall’s Oyster 82 Zig Zag was second, setting up a last-race battle with Catalina for runner-up in class. 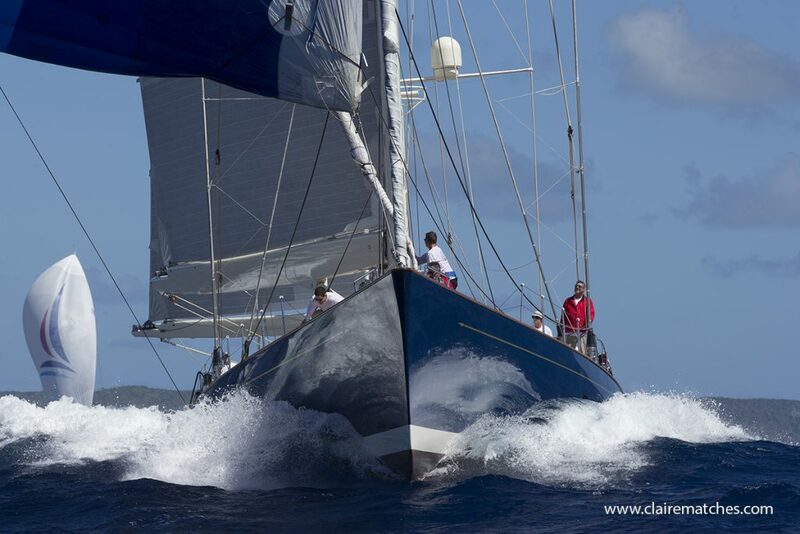 The 148ft (45m) Dubois ketch Catalina is part of the history of The Superyacht Challenge Antigua, her former owners, the Gosnells, donated the ship’s bell and that is the only trophy awarded at the regatta. Each yacht competing yachts, and the race committee, cast one vote for the yacht that has competed in the Spirit of the Regatta, both afloat and ashore. The winner lifts The Gosnell Trophy. Catalina’s Captain Shaun Whitney, has been with Catalina for two years, sailing the Atlantic, the Baltic and up to St.Petersburg Russia. After a refit in Pendennis, Catalina has returned to Antigua, and has plans to cruise the Pacific. Fun is very much part of the Superyacht Challenge Antigua but also an opportunity to raise money for a worthy cause.The organizing committee of the Super Yacht Challenge Antigua, along with SUP Antigua, organised a paddle board competition with proceeds going towards Cottage of Hope. This is the charity of Team Antigua Island Girls, which went into the records books on 28th January as the first all-black female team to row across the Atlantic. On a make-shift course off Nelson’s Dockyard Super Yacht Beach, teams of three battled in a relay race for the win. There was high drama in the final! As what can only be described as a course invasion and a bought of paddle-pinching – required sorting out by Principal Race Officer, John Coveney. The final race was re-run and the winner, and still reigning champions, was Team Antigua Island Boys. However the real winners was The Cottage of Hope, a privately run home in Antigua offering a normal life to abandoned girls of all ages.